H.E. Gangteng Tulku Rinpoche, one of three main lineage holders of the Pema Lingpa tradition, is the abbot of Gangteng Monastery known in Bhutan as the Second Glorious Copper Coloured Mountain. 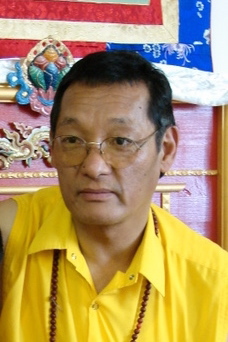 Rinpoche is also a lineage holder in other Nyingma and Kargyu traditions of Vajrayana Buddhism. At an early age Rinpoche was recognized by H.H. Karmapa and H.H. Dudjom Rinpoche as the body emanation incarnation of Pema Lingpa, the extraordinary spiritual master and Terton (Dharma Treasure Revealer) predicted by Guru Padma Sambhava in the 8th century C.E. Guru Padma Sambhava first established the lineages of Vajrayana Buddhism in the Himalayan region of present day Bhutan, Sikkim, Nepal and Tibet in the 8th century C.E. Pema Lingpa is revered as the patron saint of Bhutan and stories of his daring exploits in revealing terma (dharma treasures) and confronting sceptics are part of Bhutanese cultural lore. Pema Lingpa specified the location and name of Gangteng Monastery, which was built in the mid 1500's C.E. by his incarnation, the first Gangteng Tulku. In accordance with prophecy, all subsequent Gangteng Tulkus have taken birth in Bhutan. The present Gangteng Tulku is the 9th incarnation in this lineage. Rinpoche was born in 1955 near Tongsa in central Bhutan and following the traditional education of an incarnate lama at Tongsa Monastery, he was formally enthroned at Gangteng Monastery. He has received transmissions and intensive training from some of the greatest masters of our time, including H.H. Dudjom Rinpoche, H.H. Dilgo Khyentse Rinpoche, H.H. Penor Rinpoche, Venerable Chatral Rinpoche, and Je Khenpo Tensin Dhendup, the spiritual courterpart in Bhutan to the King. Rinpoche has spent 12 years in retreat, studying and meditating to fully accomplish realization of the teachings. He has perfected transmission of the Nyingma and Kargyu traditions. In addition to Gangteng Monastery, Rinpoche is responsible for 35 other monasteries, temples, hermitages and universities in Bhutan, including a study and meditation centre for women and girls, the first of its kind in Bhutan. His students number in the thousands and live throughout the Himalayan countries, India, Europe, North America, Asia and Africa. Rinpoche first visited North America in 1986 and Canada in 1989. Since then, under his spiritual guidance, Yeshe Khorlo centres have been established in Canada, the United States, Europe and Singapore. These centres are places where people can study and practice the teachings of Vajrayana and in particular the teachings of the Pema Lingpa Lineage. The Jewel Rosary of The Successive Incarnations of Gangteng Tulku a biography of the Gangteng Tulku Lineage of the Dharma Activity Emanation of Pema Lingpa.